This week I have been lucky enough to be the guest of REUNA in Chile, presenting at their eScience Workshop in Santiago. REUNA is a not-for-profit organisation connecting 16 universities in Chile, working to promote and advance grid computing in the region and bringing together science and business to exchange ideas. 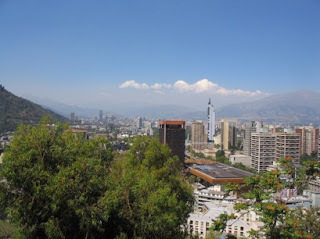 REUNA is the original NREN in Chile, connecting the country to the 20,000 gridified institutions around the world via RedCLARA and the ALICE2 project. REUNA have been investigating the state of the art in the region, setting up grid pilots in areas such as climate change, bioscience and grid technology, transferring expertise through training and setting up an action plan for the future. Many other areas of research are ripe for grid computing, including astronomy, engineering, education and physics. REUNA has also set up collaboration meetings with individual business sectors that are important for Chile, including copper production, agriculture, viticulture and nanoscience. Comisión Nacional de Investigación Científica y Tecnológica, CONICYT, supported the set up of REUNA and is particularly concerned with business relations. Marcela Iglesias of CONICYT reminded us of the barriers to grid adoption, including the fact that business and science often speak different languages (a point that chimed particularly closely with me as one of the few non Spanish speakers at the meeting – I was extremely grateful for the heroic efforts of the translators). CONICYT are working to build bridges between the two, establishing clusters of research centres, registering the particular needs of different sectors and setting up ‘brokers’ on each side of the divide. We heard from several of the scientists doing pioneering work in these areas, including the UCRAV project, which provides remote instrument operation over the grid. Not every university has access to their own X-ray diffractometer, NMR machine, PCR sequencer or electron microscope and many Chilean companies certainly don’t – through the http://www.ucrav.cl/ project, institutions volunteering the use of their instruments can donate time to others for mutual benefit. David Holmes of the Centre for Bioinformatics and Genome Biology at the Fundacion Ciencia para la Vida (http://www.cienciavida.cl/) talked us through some of the exciting work coming from his research team – just 16 PhDs, 26 doctoral students and 15 undergrads are making an impressive impact on research in medicine, fisheries, grapes, copper and trees. As in many other areas of science, the data tsunami is poised to hit the genome research community – as the cost of sequencing genes plummets, the growth in the number of base pairs being sequenced soars literally exponentially. Over 1000 genomes from the elephant, chicken and llama to chimps and Neanderthal man have been sequenced (apparently we now know our distant ancestors’ skin and hair colour). David’s team is also looking at the biorecovery of copper, when bacterial organisms liberative copper from the crushed ore. Currently under construction in Chile is the world’s largest bioreactor – at 5km long, 3km wide and 120 metres deep, this giant copper bioleaching lake, La Mina Escondida would take the Niagara river three days to fill. The FCV will fish out the bacteria munching at the ore and spitting out copper, sequence their genomes and find out exactly what species are in this vast mine and what they are doing, benefiting an industry that still contributes 50% of Chile’s GDP. Visiting Chile has been amazing experience and the politeness and helpfulness of my hosts no less than impeccable. Experiencing a few days of 30 degree sunshine while Europe is buried under mounds of snow has not exactly been a chore either – I will be saying goodbye to the southern hemisphere with a significant amount of reluctance! Wow sounds like a really interesting conference Catherine - very jealous of the sunshine!